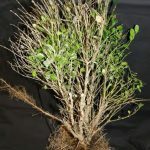 A boxwood blight, caused by an aggressive fungus disease, has started to invade the North American continent, after it had spread throughout Europe and New Zealand. Last October, US authorities confirmed that the blight had jumped continents, and started infections in North Carolina and Connecticut. 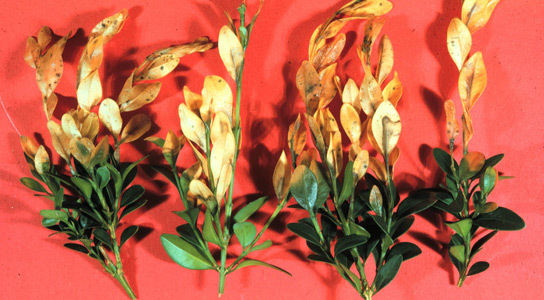 The boxwood blight, caused by the Cylindrocladium fungus, was unknown before the year 2000. By mid-January, the fungus has turned up in at least five more states in the US — Virginia, Maryland, Rhode Island, Massachusetts and Oregon — and in British Columbia in Canada. The blight starts with spots on leaves, as well as black streaks on twigs. In a few weeks, a plump shrub can be transformed into a clump of bare sticks. Younger plants will die while older ones, which do survive, will regrow their leaves for a few cycles of attack by the fungus. However, topiaries and hedges will probably be ruined. Once the fungus, either C. pseudonaviculatum or C. buxicola, strikes a garden, plant pathologists recommend drastic measures to fight off long-lasting fungal residue. In North Carolina, a grower burned 15,000 infected boxwood plants as well as 15,000 uninfected ones. Boxwood plants haven’t evolved much resistance to this fungus, so it might come from an unfamiliar source. The fungus is difficult to trace, since all samples belong to just two lineages of clones, making a trace not very significant. However, boxwood has managed to weather the storm in Europe and New Zealand, so the same will most probably apply to North American. Be the first to comment on "Boxwood Fungus Blight Invades North America After Taking Europe and New Zealand by Storm"